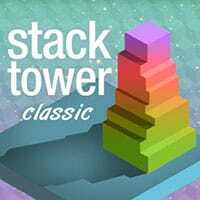 Stack Tower Classic. This minimalist skill game is easy to play, but hard to master – and insanely addictive! Perfect timing is crucial: tap at the right moment to stack blocks on top of each other and try to build the highest tower. Can you achieve a high score? This game can be played on all devices. Enjoy and have fun in playing this free online game. Good luck. On RoundGames.net you can play free online games no download and no registration. Play free online hidden object games, puzzle games, strategy games, action games, fighting games, shooting games, addicting games, adventure games, driving games, racing games and much more. New games added everyday for free.